In my previous post, I discussed why it is beneficial to use linear MOSFETs in electronic load and performed a couple of experiments using a single IXYS’ IXTK90N25L2 linear MOSFET. 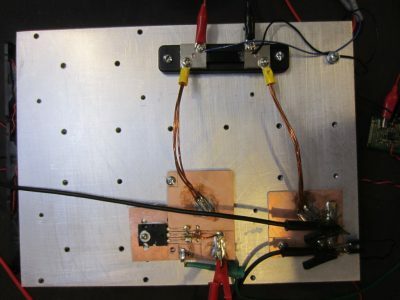 The electronic load was able to dissipate around 150W before the case temperature of the MOSFET reached 90°C. According to the datasheet, IXTK90N25L2 has a thermal resistance of 0.13°C/W from junction to case and an additional 0.15°C/W from case to surrounding. So assume that the environment is at 20°C. 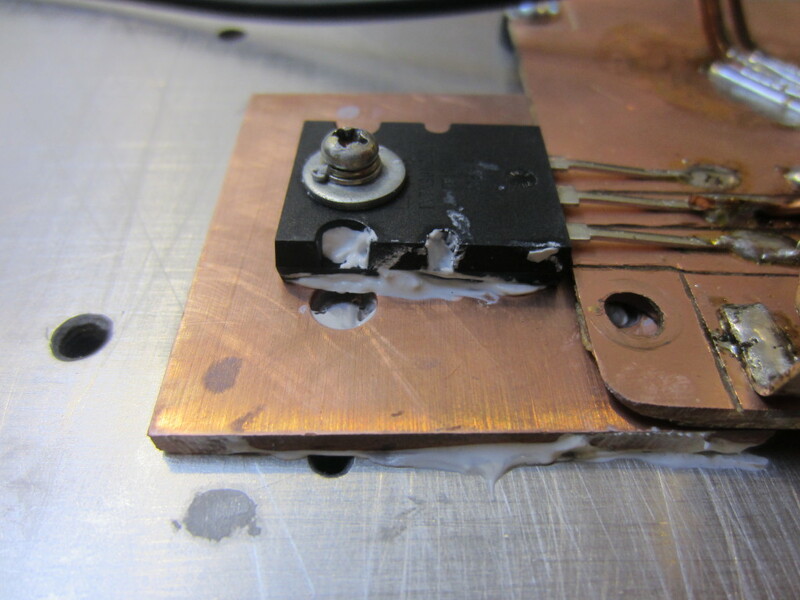 With an ideal heatsink, we can roughly dissipate 286W before the junction temperature reaches 100°C (i.e. (100-20)/(0.13+0.15)=285.7). For a heatsink as large as the one I used, the thermal resistance is at around 0.05°C/W,. So at the very least, I should be able to push it to dissipate 200W with some tweaks. One issue with this aluminum block I am using as I mentioned previously is that it’s surface is a little bit rough, which hinders heat dissipation. So I sanded it down a little bit with a planer sander using some fine sand paper. Last time, I also used a mica pad underneath the MOSFET to insulate its drain from the heatsink. This time around though, I decided to remove the insulation layer altogether. This means that the heatsink would be connected to the drain directly. This shouldn’t be of an issue for testing purpose as long as I don’t short anything with the heatsink. The overall circuit arrangement is largely the same as what I had previously. With this setup I was able to sink 10A at 20V (200W) with a maximum case temperature of 88°C, whereas if you recall, we were only able to dissipate 150W last time (10A at 15V) and the case temperature was already at 90°C.